Good Sounds upgrades school auditorium with X5i-P line arrays, flown with Minibeam rigging hardware. As part of a major renovation to its auditorium, South Allegheny High School recently upgraded its sound reinforcement capabilities. 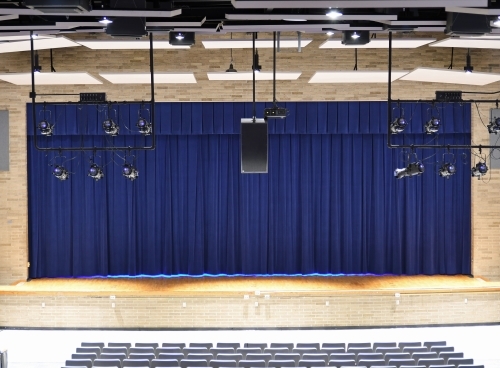 As the school’s primary venue for lectures, presentations, musical performances, and theatrical offerings, school administrators recognized the need for a quality sound system that offered clear speech intelligibility and solid music reproduction characteristics. This is precisely why they opted for the X5i-P line array, which is a member of the WorxAudio product line offered by PreSonus Commercial Division of Baton Rouge, LA. Good Sounds of New Stanton, PA, a design / build firm specializing in sound, video, and lighting systems for commercial spaces, schools, and houses of worship, was contracted to handle the sound reinforcement system installation at South Allegheny High School. Company owner Dwight Brown, CTS, who in addition to overseeing sales also serves as the firm’s principal designer, discussed the project and his reasons for deploying the PreSonus WorxAudio X5i-P line array. “The PreSonus WorxAudio loudspeaker is positioned over the front center of the stage area and is flown using the company’s 8-inch beam clamp along with 1.5-inch couplers and their Minibeam rigging hardware,” Brown continues. “The schedule 40 pipe positions the enclosure at a height of 18 feet above the auditorium floor. The South Allegheny High School installation project took place in late August 2016 and the system was put into service shortly after.